Stop munching on that overpriced kale! Every few years, some new miracle superfood is marketed as a magical cure for every ailment under the sun. Whether it’s chia seeds or goji berries, there’s always some new fad coming down the pike. While most so-called superfoods are indeed perfectly healthy, the benefits can be exaggerated to ridiculous levels. Don’t buy into the hype, and consider cheaper alternatives to these not-so-superfoods. Chia seeds can be great fun to cook with, but their biggest selling point is a high omega-3 content. It’s totally true that chia seeds have more omega-3 than salmon, but there’s a catch. The omega-3 in chia is much harder for the body to absorb than that found in fish. In reality, you’d need to eat 100 grams of chia seeds to get the equivalent amount of omega-3 as you would from just two to three grams of salmon. So unless you live in South America, flax seeds are probably a cheaper, equally healthy option. There’s no doubt about it; kale is healthy. However, kale really isn’t much better than cheaper alternatives, like spinach. Maybe Popeye was on to something after all. Other cheaper alternatives include collard greens and chard. These exotic berries were all the rage back in the mid-2000s, with advocates claiming they can do everything from fight the common cold to cancer, to even extending your life by a few centuries. There is little to no evidence to substantiate most of these seemingly miraculous claims. In reality, goji are just sweet, tasty berries with a reasonably good mix of nutrients. They can, however, react badly to some diabetes medications, along with blood thinners and a few other drugs. Allergic reactions are also possible. Another new millennium favorite, acai berries have been touted as a weight loss miracle food. There is, however, pretty much zero reason to believe this, according to fitness and nutrition expert Dr. Melina Jampolis. “There is no evidence linking the acai berry to weight loss. In fact, many of the juice products that contain acai are also loaded with sugar, which could impair weight loss if consumed in excess,” she stated. On the plus side, acai berries do have very high levels of antioxidants. So do blueberries, cranberries, raspberries, blackberries, strawberries, cherries, plums, apples, kidney beans, prunes and artichokes. So just pick whichever is on special at the supermarket. I’ll admit, I have a serious weakness for avocado. Just thinking about it makes me want to drop everything and slather some toast in the good stuff. Lucky for me, avocados are a fantastic source of healthy monounsaturated fat and vitamin E. The former is believed to help protect against heart disease. However, the avocado’s biggest strength also happens to be its biggest weakness. Avocados are extremely high in calories. So much so, that the average avocado contains more calories than a Mars bar. So if you’re trying to lose weight, steer clear of any avocado lattes. You’d be better off with a block of chocolate instead. Not only are these pink little balls of joy utterly delicious, they’re also supposedly capable of warding off arthritis, cancer, Alzheimer’s and Crohn’s disease. Too bad there’s very little evidence to support any of these claims (except of course, for the delicious part). Pomegranates’ reputation was dealt a serious blow in 2012, when a U.S. judge ordered beverage company POM Wonderful to stop claiming its pomegranate juice could reduce the risk of health problems like cancer and heart disease. So if a judge doesn’t believe these claims, why should you? Of course, there’s nothing wrong with pomegranates, but virtually any other widely consumed fruit is just as good. Hey Buddy!, I found this information for you: "6 ‘Superfoods’ To Stop Wasting Money On (And What To Buy Instead)". 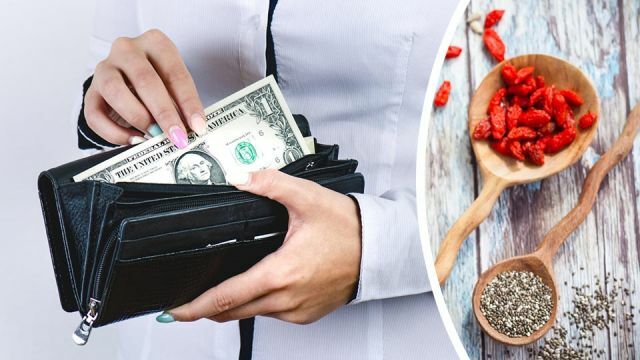 Here is the website link: https://www.thealternativedaily.com/6-superfoods-to-stop-wasting-money-on-and-what-to-buy-instead/. Thank you.